Starring Frances McDormand, Woody Harrelson, Sam Rockwell, John Hawkes, Peter Dinklage, Abbie Cornish, Caleb Landry Jones, Kathryn Newton, Lucas Hedges, Clarke Peters, Kerry Condon, Zeljko Ivanek, Brendan Sexton III, Samara Weaving, Nick Searcy, Amanda Warren, Sandy Martin and Darrell Britt-Gibson. Distributed by Fox Searchlight Pictures. 115 minutes. Rated R.
In Three Billboards Outside Ebbing, Missouri, a mother, Mildred Hayes (Frances McDormand), doesn’t merely grieve for her daughter who was raped and murdered in a particularly grisly way, she takes action. 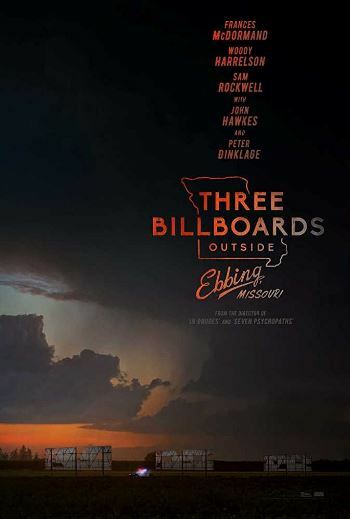 She has felt that the local police have done little to solve the crime, so she issues her own public complaint in a particularly dramatic way – by buying space on three billboards outside her home, demonstratively declaring the local sheriff’s incompetence. Her response is not unlike the firestorm hitting the media nowadays as certain powerful men are being accused of sexual assault, harassment and cover ups. One only wonders how many of these stories would have come to the light if one of those affected had said something sooner, or as demonstratively as does Mildred Hayes. One wonders what would have happened if these victims had been paid attention to, rather than see their accusations swept under the rug, or been paid off. The frustration Hayes feels is like that of many people today – and then she takes action. This sets off a series of reactions – on the part of both law enforcement and the locals – which was not unexpected, but was also painful for her and her family. The townspeople are upset over the billboards’ content, particularly Sheriff Bill Willoughby (Woody Harrelson) and incompetent, racist officer Jason Dixon (Sam Rockwell). Many people also find the signs in bad taste, considering that Willoughby suffers from terminal pancreatic cancer. Soon after the billboards are put up, Mildred and her depressed son Robbie (Lucas Hedges) are harassed and threatened, but Mildred stays firm, much to Robbie’s chagrin. A cascading series of events tumble down until Mildred surprisingly joins forces with enervated former officer Dixon to track down the perpetrator…, or someone else who has assaulted women, as well. An internationally recognized playwright and occasional film director, Irishman Martin McDonagh skillfully toys with emotions and possible outcomes in order to force an audience to allay their expectations. He did something of the same with his earlier film In Bruges, where he humorously stood expectations on their head. If any film that’s come out this season turns simple, raw emotions like rage and frustration into a deep psychological essay, then it’s this one. But none of it could have happened without the director’s partnership with such a unique set of actors. The core acting trio, which exudes the film’s glue – McDormand, Harrelson and Rockwell – emotionally inhabit their characters so successfully that they deeply engage audiences. If any film warrants a crop of award noms, it’s this one. Tags: Abbie Cornish, Amanda Warren, brad balfour, Brendan Sexton III, Caleb Landry Jones, clarke peters, Darrell Britt-Gibson, Frances McDormand, in bruges, John Hawkes, Kathryn Newton, Kerry Condon, Lucas Hedges, martin mcdonagh, movie review, Nick Searcy, Peter Dinklage, PopEntertainment.com, Sam Rockwell, Samara Weaving, Sandy Martin, Three Billboards Outside Ebbing Missouri, Woody Harrelson, Zeljko Ivanek. Bookmark the permalink.